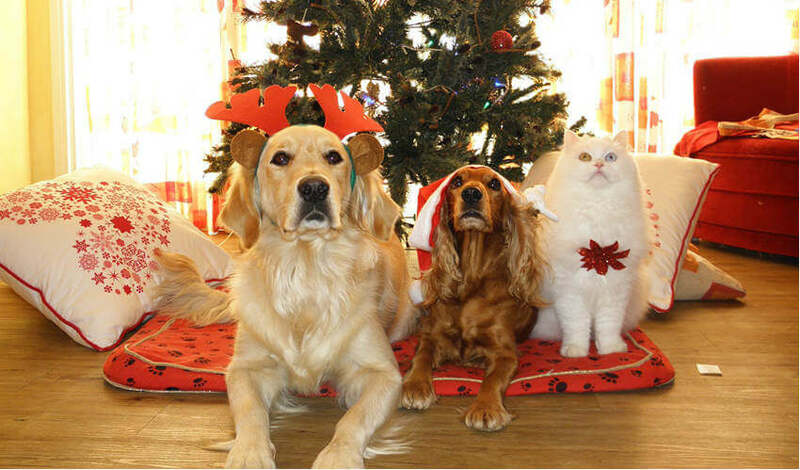 'Tis the Season to Keep Pets Safe | Woof Report | The best email newsletter for dog lovers. Be sure to keep your pups safe from harm this holiday season with our dog holiday safety tips. The food, the decorations, the parties…the festive season comes with lots of fun, and hidden dangers for your best friend too. 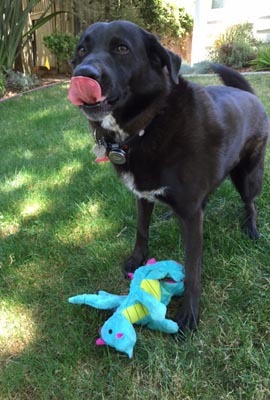 So to keep pets safe while the good times roll, Woof Report offers you these friendly reminders from Marty Smith, DVM at the peteducation.com website from Doctors Foster and Smith. Dogs know when something good is cooking. And leftover fatty foods like gravy and grease are just too tempting. But since rich foods can cause painful pancreatitis in dogs, be sure to keep them covered and away, out of your pup’s reach. Sweet eggnog left at table level invites a canine partier to sample. And since serious intoxication harms hundreds of dogs each year, it’s best to make sure glasses are cleared away and all alcohol is kept far away from his fuzzy mug. Or at least hide it. Not only is it irresistible to many dogs (especially dark baking chocolates, fudge and candy), but chocolate, as well as coffee and tea, contain dangerous components called xanthines with can cause damage to nervous and urinary systems and heart muscle stimulation. All the goodies from the kitchen call out to your dog from the garbage can. Make sure he can’t get the plastic wraps, bones, trimmings and other temptations from the trash, no matter how hard he tries. Make sure to keep all holiday greenery out of pet range. Poinsettias, mistletoe, and holly can all cause problems such as stomach upset, diarrhea and in some cases even death if ingested. So with leaves and berries that may break off or fall within pet range, why take the chance? We say stay on the safe side, skip the real thing and decorate with festive artificial greenery. Ribbons, bows, yarn, and string beckon the furriest members of your household to play. But when ingested or tied around a pup’s neck, the situation can turn tragic quickly. Keep wrapped presents and other potentially dangerous décor out of pup range. Electrical cords, toxic needle droppings, tasty food trimmings, and easily broken glass balls are just a few of the things to consider when setting up a dog-safe tree. Also, since fertilizers, insecticides, or flame-retardants may have been used to grow the tree, the residue is likely in the water basin at the tree’s base. 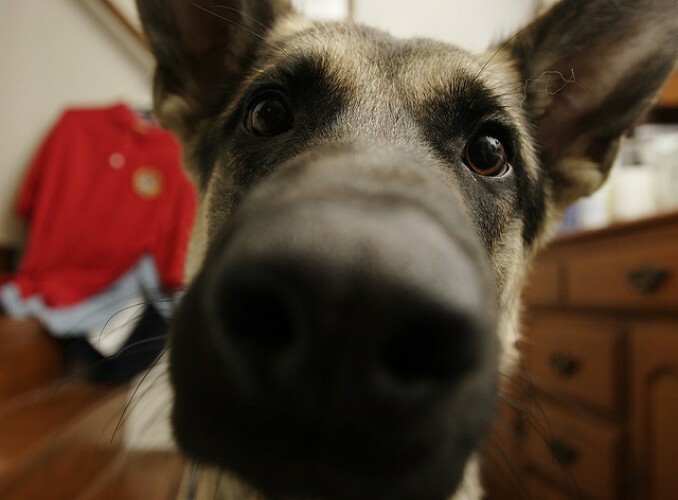 To keep your dog’s snout out, provide him with fresh water and cover the water basin with a tree skirt. For more information about pet safety this holiday season, check out Drs. Foster & Smith Pet Education site. If you suspect your pet has ingested something dangerous, call your vet or the ASPCA Animal Poison Control Center’s 24-Hour hotline (888/426-4435) right away. Thank you to Kristin, Maggie and Riley for the photo.